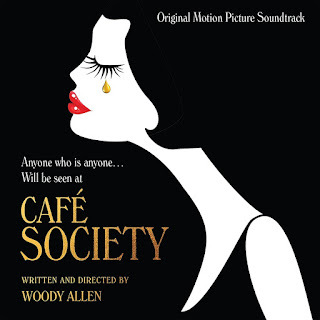 Review: Not all Woody Allen’s movies are good, but they always have great music and this CAFÉ SOCIETY is no exception. This time around, almost all the songs are by Rodgers & Hart, one of my favorite musical teams. Besides the usual old recordings, there are new jazzy ones by Vince Giordano & The Nighthawks, that are perfect to create a nostalgic mood that I love; Kate Edmonson join this guys for a nice rendition of “Mountain Greenery”. It’s always a pleasure to listen to the likes of Rodgers & Hart’s “The Lady is a Tramp”, “I Didn’t Know What Time It Was”, “This Can’t Be Love”, “Manhattan” or “There’s a Small Hotel”. And there’s also other terrific songs like “Pick Yourself Up” by Jerome Kern & Dorothy Fields, “I Only Have Eyes for You” by Harry Warren & Al Dubin or “Zing! Went the Strings of My Heart” by James F. Hanley. So lovers of great music will surely enjoy this new soundtrack, I sure do! There’s no doubt, he may fail on some of his movies, but Woody Allen’s music taste is irreprehensible!